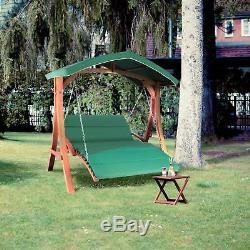 Blumfeldt Aruba Hollywood Swing Garden Swing 130 cm 2-Seater Solid Wood. Constructed from solid larch wood beams (6 x 8 cm). Sun sail for protection from direct sunlight that swings with you. 4 cm thick padding for a cosily soft seat. 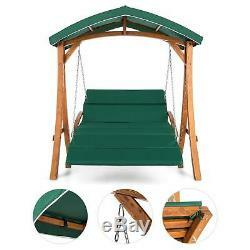 Sturdy Hollywood swing for gardens or terraces. Curved seat and reclining surface with lounger comfort. Material used for wooden parts: larch wood. Weathering protection: all wooden parts are varnished. Foam padding and polyester covering. Canopy made out of water-repellent polyester. Snap hooks and chains made out of stainless steel. 190 x 215 x 180 cm (WxHxD). 130 x 60 x 140 cm (WxHxD). 190 x 35 x 110 cm (WxHxD). 1 x swing (assembly kit). English assembly guide (other language: German). 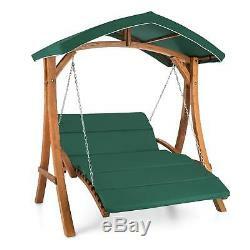 2-seater Hollywood swing with a 130 cm wide seat area for stress relief and relaxation in your garden or on your terrace. High quality and and sturdy construction from 6 x 8 cm solid larch wood beams and stainless steel chains for maximum load capacity of up to 240 kg. Super soft, 4 cm thick seat padding with water-repellent polyester cover and large, green polyester sun sail. Simply switch off: relaxation in the garden or on the terrace with the Blumfeldt Aruba Hollywood /strong>. Gentle swinging on cosily soft padding; the classy way to unwind. For quality time in the garden or on the terrace. The Blumfeldt Aruba Hollywood makes it very easy to get away from the daily grind. 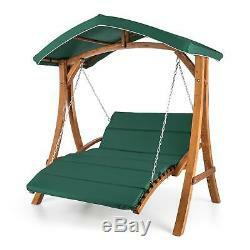 You can swing alone or comfortably in a pair, as there is 130 cm of soft, curved sitting and lounging space. It's just like a deck chair. The overarching sun sail, which swings with you, provides additional privacy and protects you from annoying rays of sun-no matter where you are. You can also rest assured with regards to the stability of the swing. Solid wood beams, stainless steel chains and fully galvanised screws ensure a highly stable construction that can handle weights of up to 240 kg. The dark green sun sail and the weather-resistant larch wood create a feeling of summer in any sitting area. Classy comfort and high load capacity: 130 cm wide sitting area with 4 cm thick seat padding and sun sail. Larch wood beams and stainless steel chains allow for a maximum load of 250 kg. Take a lively respite as the Blumfeldt Aruba Hollywood swing turns your garden or terrace into a summerly haven of peace. Available models: Hollywood swing with lounge seat and canopy , Hollywood swing with sun sail (product: 10029199), Hollywood swing with canopy (product: 10029200). Please note that real wood ages and is susceptible to weathering: Cracks or discolourations in the wood are normal and emphasise the unique character of this product. They do not impair the safety of the swing. In order to retain the wood protection, the wooden parts should be revarnished as required and weather protection should be applied every 1 to 2 years. 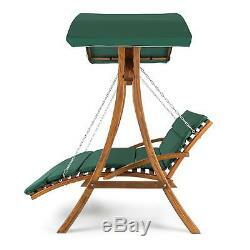 The item "BRAND NEW GARDEN PATIO SWING SEATS 2 SEATER OUTDOOR HAMMOCKS CHAIR BENCH GREEN" is in sale since Monday, November 19, 2018.